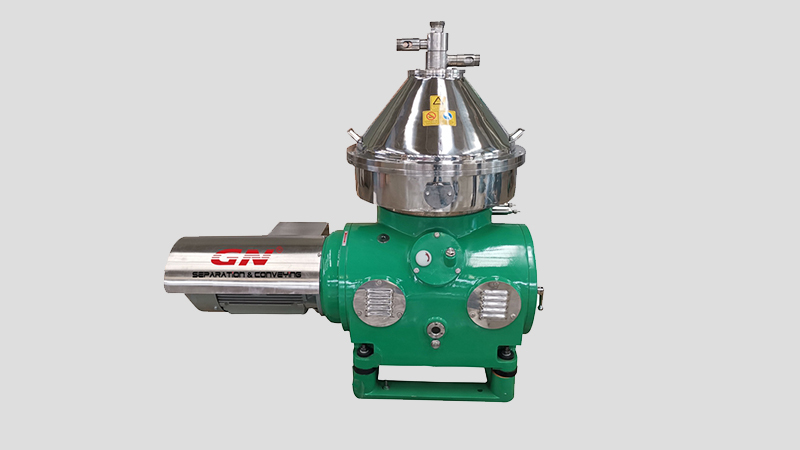 GN Disc Separator is a high-speed, stable, airtight, high-efficiency and automatic slagging three-phase separation equipment, widely used for oil, mud and water separation. All wearing parts are made of high-grade stainless steel, which effectively reduce the chemical action of the separated material and the surface of the wet-touch parts. The separated light and heavy phase materials are respectively output by two centripetal pumps of different sizes. The machine adopts the upper feeding form, and the inlet pressure for the material is low. The power transmission adopts hydraulic coupling and a pair of spiral speed increasing gears or belt driven, which can achieve stable speed increase and overload protection. The slagging action of the sliding piston is automatically controlled by a PLC automatic control cabinet, which is specially designed with safety protection device, which can achieve high level of automation, strong adaptability to craft adjustment and convenient adjustment. It has the advantages of high revolving speed, stable operation, complete sealing of the import and export system, low noise and good separation effect. The professionally designed centripetal pump system has the characteristics of stable output pressure, large adjustment range and convenient operation. Separator is a high-speed, stable, airtight, high-efficiency and automatic slagging three-phase separation equipment, widely used for oil, mud and water separation. All wearing parts are made of high-grade stainless steel, which effectively reduce the chemical action of the separated material and the surface of the wet-touch parts. The separated light and heavy phase materials are respectively output by two centripetal pumps of different sizes. The machine adopts the upper feeding form, and the inlet pressure for the material is low. The power transmission adopts hydraulic coupling and a pair of spiral speed increasing gears or belt driven, which can achieve stable speed increase and overload protection. The separated material is feed into the heart part of the machine, which is inside the drum. Under the strong centrifugal force, the material passes through the separation interval of a group of disc bundles, with the neutral hole of the disc as the interface, the liquid with a large specific gravity moves along the wall of the disc to the outside of the neutral hole, wherein the heavy slag accumulates in the sediment area, and the heavy phase flows to the upward centripetal pump. 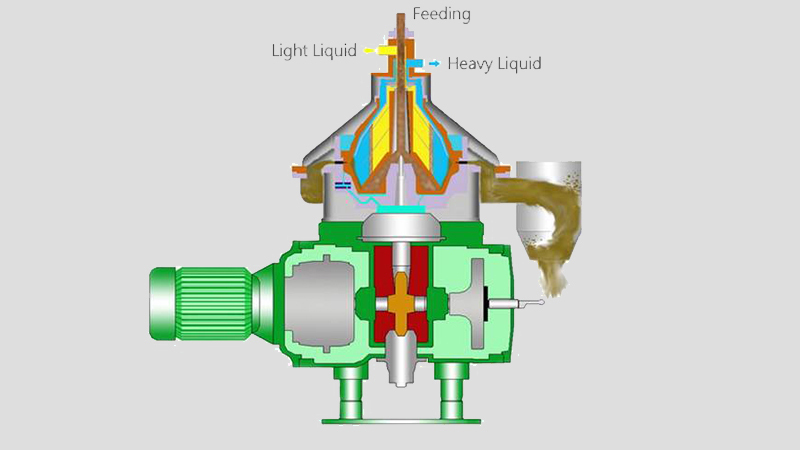 The liquid with a smaller specific gravity moves along the disc wall toward the neutral hole and converges to the lower centripetal pump. At the same time, the light and heavy phases are respectively output by the lower centripetal pump and the upper centripetal pump, and the heavy slag is periodically discharged, so continuous production can be achieved. It is especially suitable for three-phase, liquid-liquid & solids, separation, such as oil-water and sludge separation. 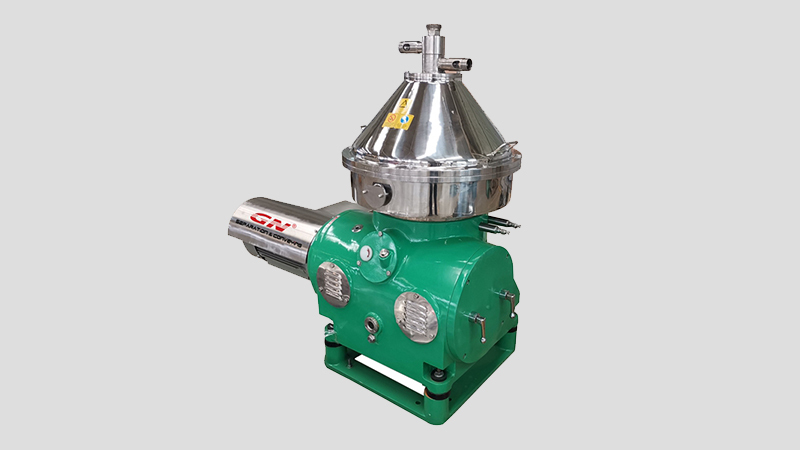 The solid phase material entering the three-phase disc separator usually shall be reduced the solid content to less than 3% and the solid particles to less than 400 micrometers by the decanter centrifuge, then the three-phase disc separator can achieve the best effect. The bowl is the heart of the disc separator. The process effect is obtained by the rotating drum with high speed. It is mainly composed of the bowl body, the bowl cover, the locking ring, the disc holder, and a group of discs, etc. Each part on the bowl is the key to the separator. The key parts are machined by CNC machine and followed strict quality control system control. After assembling these parts precisely, the whole dynamic balance test is carried out precisely. 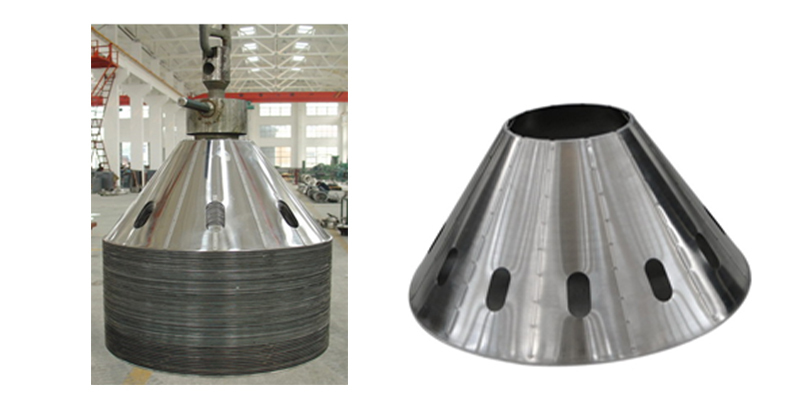 The bowl is made of imported high-strength, corrosion-resistant stainless steel material, and integral forged by high-pressure, four non-destructive testing, CNC machining, in order to ensure that the separator operates safely and reliably under long time, high load and high speed. The disc is the key part of the separator. The processing quality determines the separation effect of the machine directly. We absorb the processing technology of Alfa Laval's disc and independently develop the special processing equipment for the disc. All the processes are formed by uniform mold and processed by surface polishing and flatting. The whole process achieves the international advanced level. All the discs are spinning forming at one time, and the surface is precisely smoothed to separate the fluid under the minimum frictional resistance to obtain the best separation effect. The GN disc separator control system can perform real-time separation, start, stop, emergency stop and manual slag control, ammeter, alarm and so on. Each separator is equipped with an independent PLC control and a separate touch screen. 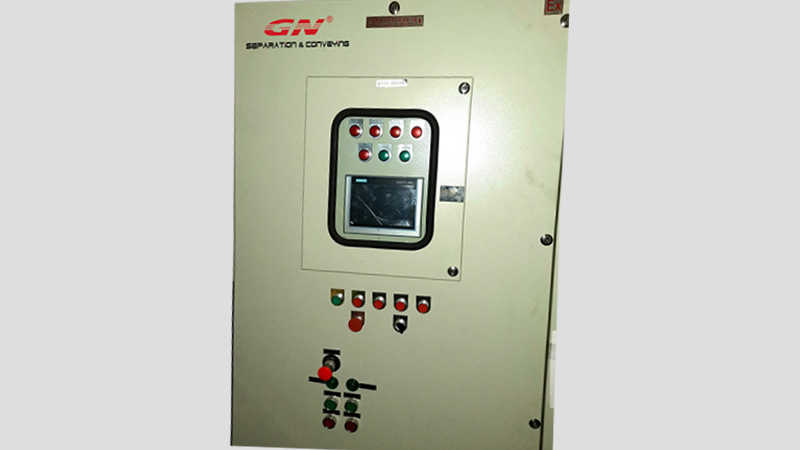 The control cabinet has an emergency stop button, and equipment would not start automatically after the recovery of power supply. PLC and touch screen are Siemens or well-known international series. Display and control the operating conditions of the separator and associated equipment. Vibration alarm of the machine: When it is exceeded the First Grade specified value, it will automatically alarm. If it is exceeded the Second Grade specified value and the delay is not eliminated, it will stop automatically. Speed alarm: When the speed of the machine is greater than or less than 5%, it will alarm automatically, and it will stop automatically after a certain time delay.